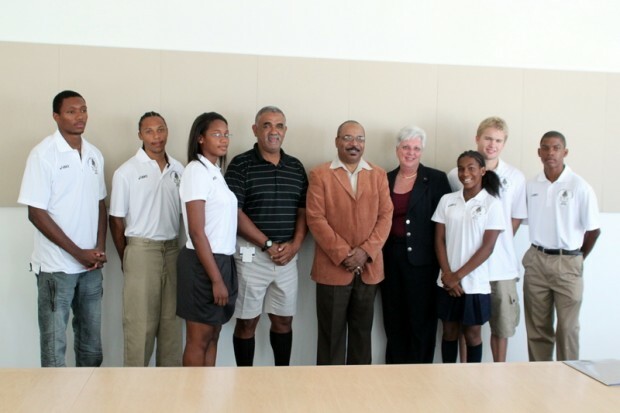 The Bermuda Olympic Association today [Aug.25] officially announced the names of the athletes who will represent Bermuda at the Commonwealth Youth Games, which are being held from September 7- 13 2011 in the Isle of Man. Eight athletes will represent Bermuda in four sports. Bruce DeGrilla, Scott Clarke, Akeila Richardson and Kyle Webb will compete in Athletics, Tre-Shun Correia and Dominique Mayho will compete in Cycling, Nicholas Patterson will compete in Swimming and Sydney Mason will compete in Gymnastics. Accompanying the athletes will be Team Leader, Calvin Simons, Senior Sport Development Officer at the Department of Youth, Sport and Recreation, Team Official & Physiotherapist, Carola Cooper of Life Thyme Wellness Clinic, and Officials Devon Bean (Athletics), Peter Dunne (Cycling), Ben Smith (Swimming) and Duke Nelligan (Gymnastics). The Commonwealth Youth Games was created under the auspices of the Commonwealth Games Federation for the purpose of providing the Commonwealth with a multi-sport event for the young public. While the chosen sports have been different for each Games, this edition of the Games will see competition in seven sports: Athletics, Badminton, Boxing, Cycling, Gymnastics, Rugby 7s and Swimming. The inaugural Commonwealth Youth Games took place in Edinburgh, Scotland in 2000. Bermuda first took part in the Commonwealth Youth Games at the second Festival in Bendigo, Australia in 2004 and competed again at the third Games in Pune, India in 2008. Good Luck at the games Kyle!!! D.A.S.H.